Hi I am new to this Forum but I guess I am the second 19 year old Bart here lol. This is my workbench. The quality isnt very good since I dont have a digital camera and had to use my phone. Two Florescent lights on the ceiling plus a lamp for extra lighting. There is a power strip on the wall plus 3 more outlets under the bench. I have one DMM. There is also a 12v battery under the bench connected to the posts on the top used for testing 12v things. 2 storage containers with little drawers for holding small parts is on top on the bench. There is also a cabinet underneath for storing bigger things and another one on the side for more room. There is also cardboards boxes scattered around the room full of parts from parted out devices and what not. The bench frame was built out of 2x4s with 2x8s on the sides. The top material is the back of a piece of slat board from an old cell phone store which is surprisingly strong and easy to clean. Over all the bench is great, easy to assemble, lots of storage, and very customizable. it comes with a 5ft florescent bulb light fixture which is perfectly placed, also comes with a power strip with a power switch. the top is a thick durable material that is like very compressed cardboard. the rest of the bench is metal. The drawers slid incredibly smooth and quiet even when they are fully loaded and heavy. it is not in the picture but i added a small vice to the top which helps alot. All in all I would give it a 9/10 , basically the bench top is not indestructible which would be best. Well after more than a month of procrastination I finally got around to posting pics of my workbench. As you can see its more of a crowded storage area than just a workbench. well thats my workbench, hope you like it. If at first you don't succeed try again, if you don't succeed a second time, give up, no use being a darn fool about it. I live in rented accommodation, so all my stuff is designed to be fairly easy to remove. Most of the benches are just wood screwed to a base, or in some cases repurposed furniture. The shop is full of hacked up tools, and converted hardware. As we walk in the door. 2) Proxxon Micro CNC milling machine. This was modified from the old stock machine to run with some large stepper motors and EMC2 CNC machine controller software. 3) Robot Arm. rescued from the trash in many small pieces. Retrofitted with new everything. 6) General purpose workbench PC. Runs Cad software schematic design etc. The bench itself is part of a folding sofa bed. The sofa is long gone, but the wood itself was reused for a large workbench. It is currently sitting atop of 2 small metal racks. We have lots of power behind there with 2x 6 way gangs. The little trolley holding the laptops rolls away underneath when I need more space. The Pillar drill is bolted on top of an old coffee table, which is bolted to the floor. 1) dual displays. mmm. Plugs into the Cad/Eagle box. 2) The desk is just a large piece of MDF screwed to an old computer desk. Oh and a vice is handy. 3) Servos retrofitted with OpenServo motor controllers Plans and code available. 5) Current work in progress. Robot arm controllers. Each one is a CPU and H-Bridge to drive the heavy duty motors on the robot arm. 6) Soldering/Relow station. Amazing bit of kit. Highly recommended! 2) A TV stand that I rescued from a skip. nice! Generally we have power supplies, tools and components. All the stuff I need regularly is on this stack. There is another larger toolbox on the floor. Bench behind the TV stand. 1) It used to be a scanner, but now it is a UV exposure unit. Works well and was a nice hack too. 2) This workbench was an old IKEA shelving unit. the benchtop is actually one side of the unit, and the other side is used for legs. 3) Spares, scrap material and cables. more racking and amazing comms! This racking holds components, components and well, you can guess the rest. The amazing comms area is a Neatgear NSLU2 network server with a couple of terrabyte harddisks in there. Broadband, wifi and workshop vlans come from here. Also is the DVR for the video camera system and some switchgear. There is my workshop. Not the best, but more than suitable for what I do. As for lighting. I use large swing-arm lamps (the ones with magnifiers) I normally have a couple running at a time. BTW you guys have some great benches! Good luck all! I am a teacher who works in a trade school for adults in Anjou (in Montreal). I teach CNC machinists (see photo) Among other projects, I have designed and made an 8 in. Dobsonian telescope from scrap aluminum (see photo) and now I am getting into robotics. Because I teach CNC machining, I can make parts for my robots on our 12 CNC machines at the school using MasterCAM (see photos) . With my students I do a project making a chess set. I am 57 years old and I love my job as a teacher. Here I am showing my first robot to a group of 6th graders. Everyone of us who has started out learning a new hobby has done the same thing : first of all, we end up working on the corner of the kitchen table until our spouse tells us to get ready for supper and we waste more time at each session looking for tools and such than we actually spend doing anything useful. Then, when we are finished, we have to take even more time to put everything back. Therefore, the time we actually spend on our hobby is greatly reduced. 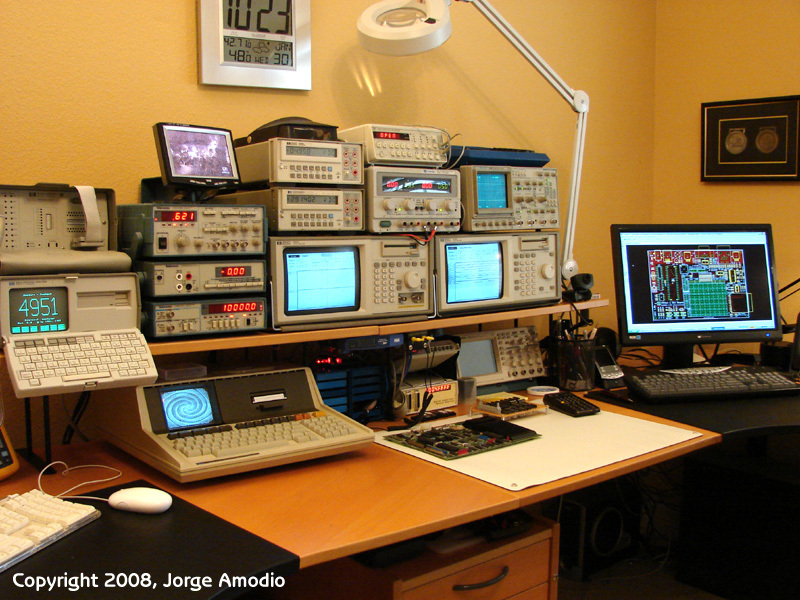 When you sit down to work at a proper workbench, your time can be more productive. a)	Small : A workbench does not have to take up a lot of room - you can install one in a corner of a bedroom - the one I have made measures 16 in. (D) x 43 in. (H) x 53 (W-including the shelves on either side). So here�s my entry : NOTE : Refer to the numbers on the photo. - (01) oscilloscope (on a shelf made of an old stand for a tractor feed printer). Great for tracing electronic signals. The tool par excellence for electronics. One suggestion for getting an oscilloscope or other equipment � check to see if there is a Freecycle site in your city (I got the impression that there is one in every major city in North America � at any rate there is one in Montreal). Freecycle is a sort of club (the Montreal one was on Yahoo) where everything is given or offered for free. . And ASK for one. It worked for me. I never thought anyone would give away one but a really nice lady gave me a single trace oscilloscope (not the one you see in the photo). After using it for a while and realising it is a top class tool for electronics, I looked around for a slightly more modern dual trace one. My conscience would not allow me to sell the first one (I got it for free), so I gave it to one of my friends. - (02) Function Generator (good for injecting test signals). - (05) various multimeters. A multimeter does not have to be expensive - I bought one at Canadian Tire for $29.99 and it included (besides the normal AC and DC voltage, resistance and amperage measurements) a frequency counter, a square wave test signal output and a capacitance measuring function. - (06) an old Black & Decker cordless screwdriver with a cord to replace the non-functioning batteries - no batteries to recharge or wear out and lots of torque (powered @ 5v from the PC power supply - see #19, below). 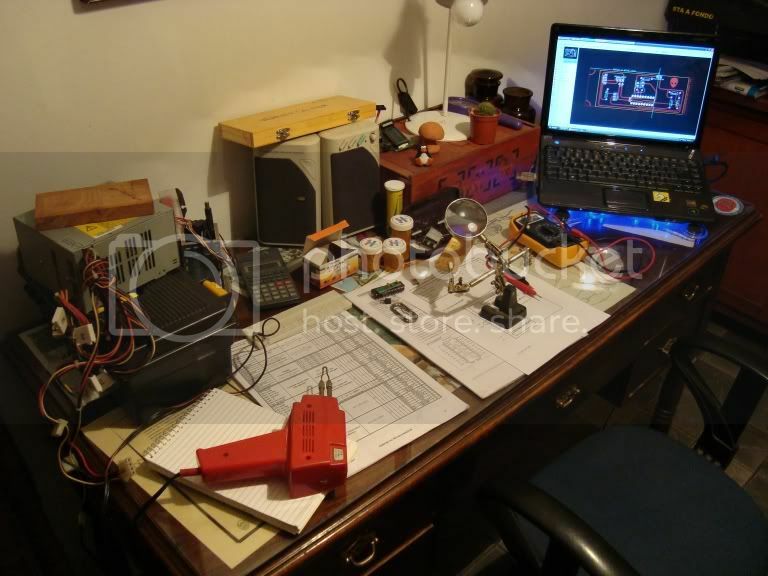 I don�t need batteries � I�m using it at my workbench after all! - (07) Flood light (I prefer incandescent lighting instead of fluorescent). - (12) - "spare hand"
- (17) � Dremel tool. - (19) - a power supply made from a PC power supply - I literally hacked the case down in size to the minimum possible - just enough to hold the electronics (look for how to use a PC power supply on the Internet - see references at the end). - (21) - Magnifiers : (1) head mounted loupe (not shown), (2) hand rectangular magnifier, (3) #3 eyeglasses (not shown). See also photo of stereo microscope. - a digital camera - great for taking pictures of what it looked like BEFORE you took it apart! I also use it when working on my car. Also great for taking a photo of something you need and then going to the store and you then show the salesperson a photo of what you need instead of trying to describe it. - favourite sites (see Annexe -A-), favourite magazines etc. - Drill press (with shelves and tooling); To make the drill press easier to use: First make sure the table of the drill press is square to the spindle by putting a cylindrical metal rod (say, 3/8 in. in dia.) in the drill chuck and then use a try square and adjust the angle of the table until it�s square with the rod. Then, drill and ream a small hole (say, � in.) underneath the table, through the flange supporting the table and into the body of the drill press. Then, any time you use the drill press to drill holes at any other angle than perpendicular, all you have to do is insert the dowel pin in the hole you drilled and reamed and the table will be square again. [see separate photo: ]. See Annexe �B- for suggestions that I sent to Nuts and Volts magazine regarding tapping threads (hope this will be useful to someone). Click on : 'View all pricing in Canadian Currency' if you want Canadian pricing. They have a Picaxe dealer in Alberta for Canadians. www.servomagazine.com (Servo Magazine - my all-time favourite magazine about robots). You can buy a CDROM with a whole year on it. 11) Buy and use only machine taps (not hand taps). These are sometimes named gun taps or spiral point taps. The advantage of these is that you do not have to keep backing out the tap - just keep on going (just be careful when you get to the bottom of the hole). They don't cost much more than the hand taps and are much easier to use (for example, at KBC Tools a 3/8-16 manual tap sells for $3.60 CAN and a spiral point tap sells for $4.88 CAN). 12) Make yourself an alignment block. This can be any small piece of scrap steel (say, 3/4 in. by 1 in. by 1/2 in thick) in which you drill a series of holes that are simply slide-fit holes for all the taps you will be using (say #4 up to 3/8 in.). As an example, you could drill a 1/4 in. hole for a 1/4 in. tap, etc. Ideally, you should drill these holes on a drill press (verify that the head of the drill press is reasonably square with the table). Then, when you wish to tap a hole in a part (after you have drilled the proper sized hole � example a #7 drill for a 1/4-20 tap), just position your new alignment block over the hole to be tapped, hold it down with one hand, insert the tap in the appropriate hole and tap away. The alignment block will keep the tap at right angles to the surface being tapped (so it starts square). This works even when tapping in awkward positions like vertical or overhead. Of course, the tap-drill has to be drilled square to the surface for this to work. I made one of these alignment blocks about 20 years ago and I still have it and use it in my basement workshop. 13) Buy yourself a ratchet-action T-handle. I bought 2 sizes, a small and a big one for about $20 each. After you have used one of these, you won't want to go back to thee old T-handle! , make sure you ask for the update information in the December 2002/January 2003 issue of the same magazine (it�s a magazine that comes out once every 2 months) for some very important updates on safety and modifications to the original article (pages 3 and 35). Just keep it away from children. (By the way, I find their site a bit hard to navigate). 16) For lubricant, try and buy some tapping oil, sometimes you can get some for free at machine-tool shows and the like. Sometimes the places that sell tools will give you a small free sample bottle. A small bottle can last a long time, especially if you only tap once and a while. For aluminum, I usually dilute the tapping oil with Varsol. In reality, any lubricant would be better than tapping completely dry � if you have to and you�re desperate, use old motor oil. (1 Use small transparent cases for each tap size containing the tap drill, the clearance drill and the tap so you don�t have to look around each time you want to tap something. Well... after watching all the participants , my workbench is a shame hehe. So here is a photo. -Lupe with arms. Must have. I ve read very good ideas from all the posts. 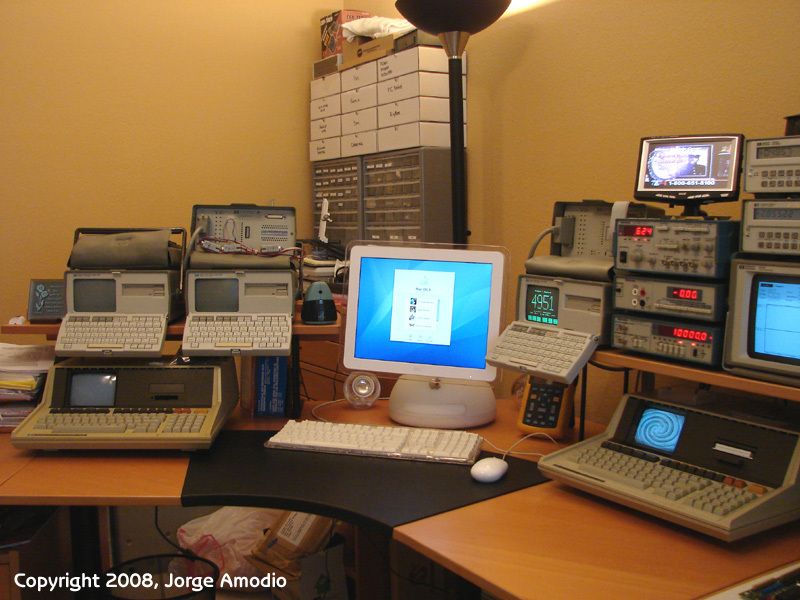 Over the years I collected some old testing gear such as protocol analyzers, logic analyzers, dmms, scopes, etc, and combined with some new stuff. Everything is operational. I've been meaning to do this for some time, but I've just been too busy.. Since I've seen other postings of various definitions of 'workbench' I figured I'd add to the list..
By day my 'workbench' consists of various optical tables, lasers, and fiber optic equpipment.. I'm currently working on my PhD in Electrical Engineering with a concentration in applied physics working with fabrication of waveguides using ultrafast lasers. The octagonal chassis on the left is the remains of a project from an embedded systems class a few years back. It's now considered a 'work in progress' (like most of what you see here). I've been meaning to work on running a mini-itx board as the 'brains' in it for some time now. On the right is my 'waterfall' project consisting of 20 PIC controlled water solenoids. Completion dates are still yet to be determined..
Computer: AMD Slot A processor - 700 MHz (old machine) with around 500 meg of memory. Wired into home network. Used mostly for programming and datasheets. Cad work is done on the office computer upstairs. 3 Tektronics 60MHz analog scopes. All are two channel scopes, one with digital storage (no delayed sweep) while the other two are your run-of-the-mill delayed sweep scopes. HP 150MHz Digital scope. This is a recent addition to the collection. Complete with GPIB data acquisition backpack, cable, and PCI card. Custom power-supply built from old (Digital VAX era) server equipment. Provides +/- 12 and +/- 5V at somewhere around 5 amps each. 8 Channel scope multiplexer. MUXes 8 channels into 1. Haven't had a need for this yet. 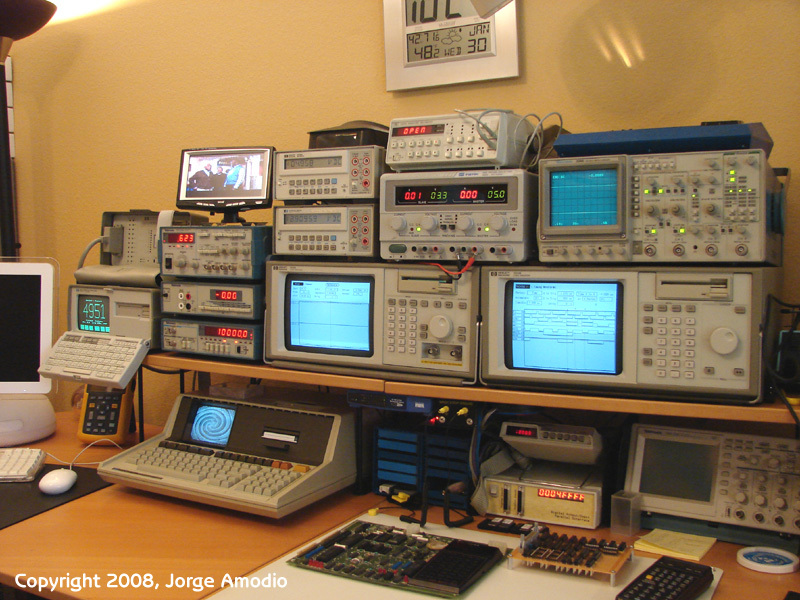 16 channel logic analyzer made by Agilent. I actually have 3 of these, but the two that aren't in use have a few blown channels in each pod so they're mostly for backup incase the main dies. This is the parallel port variety. Tektronics modular equipment rack. I have several modules for this including pulse generators, DMM with temp probe, waveform generator, frequency counter, and variable power supply. There's also a second frequency counter (stand alone) in there somewhere along with a 19" rack mount HP multi-function DMM which is unfortunately not working at the moment. Fist full of virtex-II and virtex-IV FPGA dev boards. EPIC programmer along with Microchip's ICDII. Magnifier lamp and regular desk lamp. A well lighted workspace is a MUST. Several soldering irons one of which is variable temp. Old PC sound-system (gotta have tunes as well). My lathe is on the left, currently going through a re-build to clean it up a bit. I just got this from one of the machinists here and it needed a few parts (in addition to a belt). Small craftsman bandsaw on the right. At the extreme right (not in the picture for some reason) I have an old microscope with 5 - 100x magnification. Cordless drill with dust-buster (it's mostly useless). Last but not least we have the heart of the network, the server rack. Unfortunately, it looks much cooler than it actually is. The actual rack was an old HP data acquisition equipment rack from the 80's. It's solid aluminum and would probably support a house. The instrument panels you see were originally installed with the intent of having them actually DO something, but I just never got around to it. The two large analog meters will eventually display upstream/downstream bitrate once I get the script worked out. Other than that, it's just a PII 500 running FREESCO and a 24 port DELL switch. Nothing special (but it will be). That about sums it up.. I've got more projects 'in progress' but if I keep this up, I'll be here all day.. If you're interested in seeing more, just let me know..
Make is having a show us your shop contest that some of you may be interested in entering.